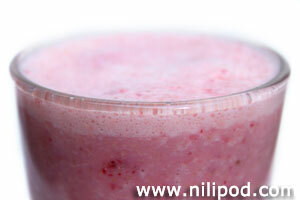 Making a smoothie drink in the morning is a good way to start off your day. There are all kinds of different smoothie and milkshake recipes that you can follow, but we recommend sneaking in some healthy ingredients that will probably go quite unnoticed, since they will be disguised by the stronger flavours of the fruit. 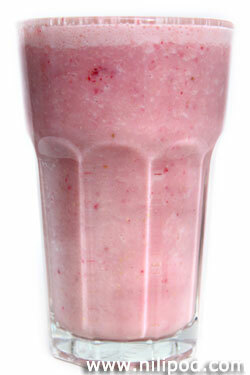 The best way to perfect your smoothie mixture is to experiment with your ingredients, adding to your basic recipe. Yoghurt adds a certain creaminess, as does protein-rich cottage cheese. For even more protein, powdered almonds or ground nuts are a good addition, and for fibre, blend up some porridge oats into a fine powder. Strawberries, blueberries and all summer fruits can be used in different quantities, although if you are using them while they are frozen, allow them to defrost first or use warmed milk to prevent your mixture becoming too thick and icy. If you are on a health kick, you can even add in some frozen carrots and broccoli. These will be virtually tasteless as they are usually overpowered by the stronger flavours of the fruit. It may sound disgusting adding in some vegetables, but they actually don't taste at all. You can even add in a squirt of tomato puree - it's actually quite sweet, although don't add too much. 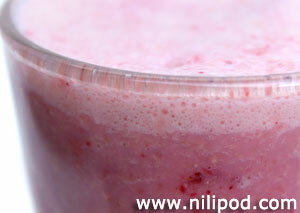 Add the porridge oats and almonds to the blender and whizz up until the oats turn into a powder. Next, add in the banana, the yoghurt, the cottage cheese and the frozen summer fruit. If your fruit is straight from the freezer, it is sensible to warm the milk slightly (30 seconds in a microwave) before you add this, to prevent your smoothie turning into more of a Slush Puppie slushie. Add in the milk and blend for up to a couple of minutes, until your healthy fruit smoothie has reached a smooth, drinkable consistency, ready to be poured into your glass.